OPENLETR — Virtual Model 'Shudu Gram' by Cameron-James Wilson: What Should Be The Limits Of Art In Society? Models are the backbone of the beauty and fashion industry. They are the humans behind the products that encourage us to shop. We either see ourselves in them or want to, and that is what makes a product look like it will fit into our lives. We see models every day; on Instagram, television, billboards, in stores, and it doesn’t end there. Nearly every ad you see features a model. This is both good and bad. As many companies such as Dove, Target or American Eagle are ending retouching and increasing diversity and inclusion with a broad group of women, the use of one body type is still vastly inculcated in the DNA of brands like Victoria Secret’s. It is hard enough for us to be constantly bombarded with only one mostly unrealistic body type that society views as the “ideal,” on top of the endless digital edits that extend body image issues. 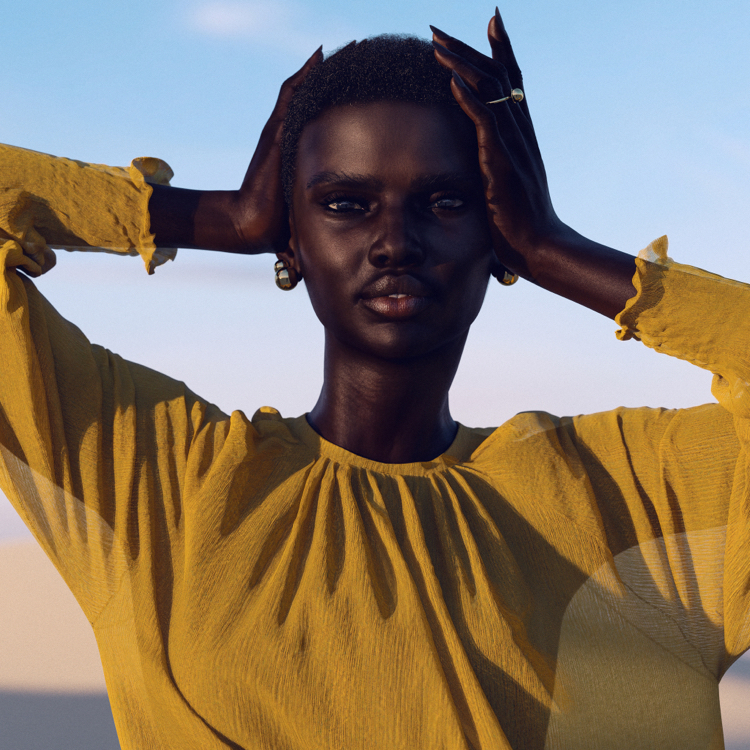 But one artist does not see it that way; Cameron-James Wilson, a self-taught photographer, created Shudu, a virtual model that is meant to be in her mid-to-late 20s and from South Africa. Shudu is indeed a gorgeous model, whose eyes have more depth than a wax figure, but it can be argued that there is quite a bit of wrong with Wilson creative endeavor from societal and cultural standpoints. With the loads of backlash accusing him of being a racist and taking modeling jobs away from women of color, in an interview he replied to the critiques that “Shudu represents what I’ve always seen as beautiful, but something I don’t see often enough. Although there’s a slight change happening now, more people need to question what really is beautiful. Basically, Shudu is my creation, she’s my art piece that I am working on at the moment. I am a photographer anyway, so it’s just a way of exploring my creativity when I’m not shooting.” It seems from his perspective, he is exposing the world to the diversity that is lacking, while many argued Wilson is nothing more than a white man profiting off the idea of a black woman, without having to pay a black woman. And quite frankly, it is not hard to see it that way. The truth is, black women are not just beautiful objects to look at; there are real women behind these images, marketing campaigns and Instagram pages, only Shudu is not. There is no arguing that Wilson is talented, but it seems that his so-called message missed the mark. Many people were thrown off as Wilson did not come right out to testify that Shudu was fake. Last year, Wilson posted a photo on the account with a caption from Shudu’s voice. It was promoting the SoulSky clothing brand and had people convinced that Shudu was in fact a real person. Many accounts even praised her with hashtags like #BlackisBeautiful and she was featured on pages celebrating women of color. Since the truth has been revealed, many are not only accusing Wilson of being a racist or at the very least ignorant, but also misusing the growth of representation of women of color as a trend to promote his talent. Yet, from what Wilson has stated publicly none of this seemed to have occurred. To some, digital models make sense. It can save companies money on photoshoots and get them the exact look they want. But is it worth it when the consumer finds it disturbing? In addition to its impact on employment, Shudu and other virtual models are another negative form of projection of beauty, adding a layer of societal pressure on women. Psychologically and subconscious, we now have to compete with more than a photoshopped woman, but also a perfectly designed virtual one. Wilson has come out to say that he will no longer use Shudu commercially. Therefore, quite a few folks perceived Shudu as his inspiration and believe him to be, in fact, anti-racist as it is a celebration of black women, defending this as a form of art; though the latest Instagram posts have been paid partnerships. Shudu has now more than 150k followers on Instagram and that number is growing by the minute. Yes, she is not a real person, but has glowing skin and a convincing gaze. What are the limits of art in our society? In a time when celebrities, comedians, and pretty much everyone but the government is held accountable for everything said and done, it is surprising that someone from the industry didn’t consider the implications of a virtual black model. Some have even said that Shudu is a way for the artist to indulge in his interest in black women without having to interact with them. This has become quite a controversial topic in the past year as more and more media outlets are featuring Wilson and Shudu, and more people are forming their opinions on the subject. The true question remains, what are the limits of art in our society?